The recipe contest has ended but I will continue to post new bread recipes from time to time. And more exciting thing to come. Bread Makes the Meal comes from a chapter title in Charlie van Over’s book The Best Bread Ever. (The chapter brings together all the things you can do with bread: from making sandwiches to canapés and bread salads.) The topic feels timely. It reminds me of the importance of meals shared with family and friends. In these unsettled times, don’t we all need something simple and restorative like bread and a meal to bring us together? Speaking of friends, the team at Emile Henry is joining me in this celebration. They have put together a marvelous giveaway tied to National Home Made Bread Day, November 17, 2016. You can win this baker’s dream kit. 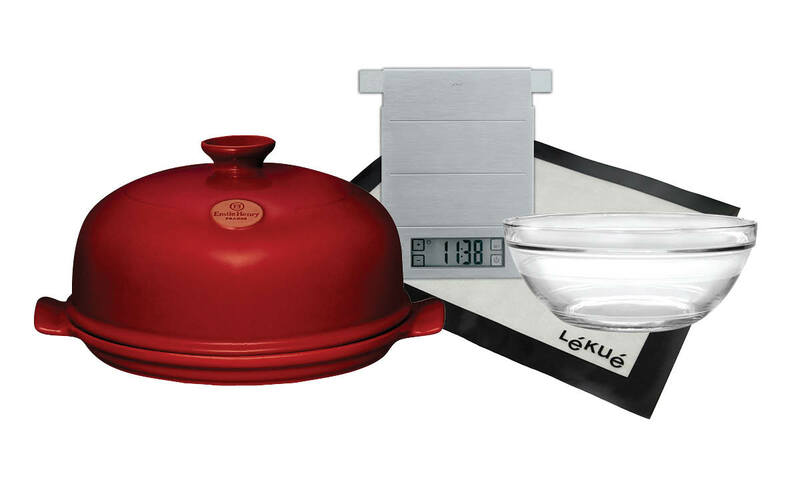 The prize includes an Emile Henry ceramic Bread Cloche, 6-quart Duralex glass bowl, Rösle Kitchen Digital Scale, Large Lékué Baking Mat, Shun Sora Bread Knife and a bag of King Arthur Flour. Imagine the fun you’ll have baking bread over the holidays. To enter the contest, all you need do is submit one of your favorite bread recipes to the Emile HenryUSA Facebook page. You can enter as many times as you like beginning October 17, 2016. The one requirement is that you submit a different recipe each time. The winner will be selected in a random drawing on November 17, 2016. And please, join my email list at the bottom of this page for my weekly recipes and baking tips. Charlie van Over will be lending his more than capable hands to this project too. Use the hashtag #breadmakesthemeal and show us what you are baking!